This weekend we were invited to a wedding. The beautiful bride is my Hubby's (sort of) step sister, so there was a big chunk of his side of the family there. Good times had by all, and a lovely bonus in my brother-in-law and missus staying in the same hotel as us. She's pregnant too, just 3 days ahead of us with their 2nd child. We stayed at a Premier Inn this time over at Brighouse, Hudderfield (Hudddersfield North) and I think it's safe to say the kids and I are sold on them! Even if we did all wind up sharing a room. All 5 of us plus bump (the kids are no where near old enough to be in a room without us yet). Luckily the room was MASSIVE being a proper family room. And the breakfast was excellent too. There was no need to go and hunt down any lunch afterwards! 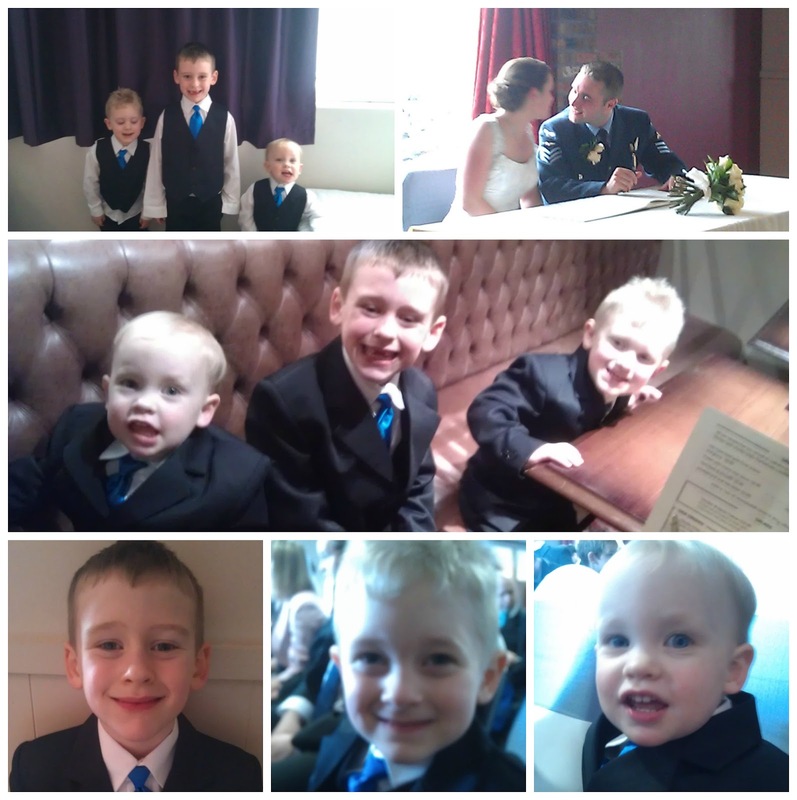 My mother-in-law had bought suits for my boys and had them sent over to us. I must get the website link to share with you. The lads looked adorable! It's such a shame they wont get another chance to wear them before they are grown out of. She ordered some similar ones for their older nephews too. Someone took a photo of them all together, and I must track a copy down! The wedding was a lovey do, and the wedding breakfast was excellent. Most of the kiddies got to sit at their own table in the middle too (not Georgie or the 5 week old baby girl whose mum shared our table) which was fabulous! They loved the independence, and frankly we parents enjoyed the break! The evening do was fab too. My 3 boys dragged me onto the dance floor for a little while where we did a strange circular dance that made sense to them... Georgie loved it and kept shouting "Dance!" and playing in the lights. Jack, we barely saw once the music started. Tom preferred to stick to his Dad's side - but that's Tom all over! By about 10:15pm they were ready to go so we drove back to the hotel and they passed out just before 11pm. They slept the whole way home!